Championship side West Brom twice came back from a goal down to force a draw and take Middlesbrough to a replay in the FA Cup fifth-round tie on Teesside. Julio Arca headed the hosts into the lead from Stewart Downing's cross but Diomansy Kamara levelled when his tame shot squirmed past Mark Schwarzer. 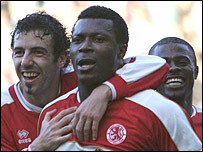 Yakubu restored Boro's lead from the spot following Curtis Davies' foul. 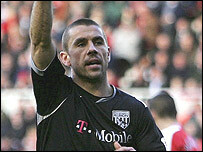 But Kevin Phillips's deflected effort sealed a draw before Davies was sent off late on for a second yellow card. Middlesbrough have yet to make things easy for themselves in the Cup this season, having twice been taken to a replay by lower-league opposition - and it was no different at the Riverside. With West Brom happy to play a patient game, the hosts struggled to find any real penetration in the first half-hour, despite the efforts of the lively Yakubu and Mark Viduka. However, the match's first moment of brilliance brought the opener, Downing jinking past Paul Robinson and clipping a fine cross on to the head of the unmarked Arca, who made no mistake. It was just reward for Boro's more ambitious approach but, rallied by their manager - former Boro stalwart Tony Mowbray - on the sidelines, the Baggies battled back. Phillips had a goal correctly ruled out for offside after poking in Paul McShane's flick-on before a more dubious decision crossed off Kamara's strike minutes later. There was no denying Kamara's finish on 41 minutes though, the Senegalese striker's tame effort slipping through Schwarzer's legs and in. Parity did not last long for the Baggies as Yakubu fired Boro back in front from the penalty spot, having been hauled down by Davies before half-time. But West Brom's resurgence continued in the second half and, after Paul McShane had gone close with a drilled effort from 12 yards, they drew level once again when Phillips' shot deflected in off Andrew Taylor. Koumas almost put the visitors in front for the first time in the game when his curled effort drifted wide, while Viduka brought a smart save from Dean Kiely. However, Kiely saved his best until last as he pulled off a brilliant stop to deny James Morrison's curled effort late on. Davies was sent off right at the end after picking up his second booking, having been yellow-carded for the penalty earlier, but the Baggies held on to ensure Boro must go to a replay for the third successive round in the FA Cup. The tie at the Hawthorns is set to take place on Tuesday 27 February. "We do love a replay at this club, that's for sure! I thought we were a bit flat after Tuesday's replay against Bristol City - the players and crowd probably felt drained after that. "But the important thing is we are still in the competition. West Brom are a Premiership side in all but name and they put on a really good performance so we had to be on our guard. "It won't be easy going there for the replay, but we know we have the players to turn it on and push us on this competition." "We could probably have done without the replay given that we are going well in the league and hopefully pushing for promotion. "But I'm proud of my players and there is no harm in putting in fine performances and that is what we've done here, against a good Premiership side. "We conceded goals at bad times but fought back well and that shows the spirit and character we have in the camp." Middlesbrough: Schwarzer, Xavier, Woodgate, Pogatetz, Taylor, Downing, Boateng, Arca, Johnson (Morrison 70), Viduka, Yakubu (Christie 79). Subs Not Used: Jones, Euell, Davies. Booked: Woodgate. Goals: Arca 29, Yakubu 45 pen. West Brom: Kiely, McShane, Clement, Curtis Davies, Robinson, Koren, Greening, Chaplow, Koumas (Gera 85), Phillips (Ellington 80), Kamara (Albrechtsen 90). Subs Not Used: Daniels, Carter. Sent Off: Curtis Davies (90). Booked: Curtis Davies. Goals: Kamara 41, Phillips 58.